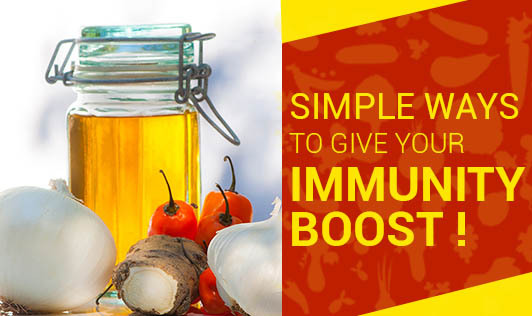 Simple Ways to Give Your Immunity a Boost! Hand washing - As a general rule, frequent hand washing is recommended throughout the day - before and after eating, after using the wash room and after coughing, sneezing etc. to prevent the microbial infections, responsible for suppressing the immunity. Think positive - People who are lively, happy and with positive attitudes are less likely to get sick and catch infections. Cytokine produced by immune cells play a role in fighting infections. Exercise regularly - Walking, jogging, swimming or cycling for 20 to 30 minutes daily can bolster many defenses of the immune system. Eat right - Specific nutrients play categorical roles in pushing the immunity up and down. Stick to vegetables and whole fruits, lean cuts of meat and whole grains. Use spices, condiments and herbs like garlic, ginger, turmeric etc. to boost the immune system. Cut down on the consumption of sugars, refined carbohydrates, junk foods etc. Bust the stress - Stress has been found to stifle the immune system. Get rid of the stress through interesting options like playing with kids or pets, watching a hilarious movie, reading a book, travelling, sports etc. Give up smoking and limit your drinks - Smoking can increase respiratory ailments and excessive drinking is toxic to immune system. Try to give up smoking and keep alcohol in moderation. Sleep tight - Six to eight hours of sleep is what everyone definitely needs for a healthy immune system.